Jazz up a tired deck and improve your seating arrangements in time for the barbecue season. You will need: a water blaster, spray bottle, scrubbing brush, sandpaper, wire brush and paint brushes. Resene Moss & Mould Killer, Resene Roof Wash and Metal Cleaner, if needed, Resene Waterborne Woodsman penetrating oil stain in Resene Natural and Resene Lumbersider in Resene Gable Green for the legs and back of the seat. 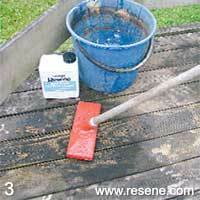 Over time, unstained decks can develop mould and unsightly black stains. 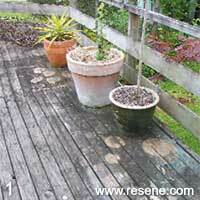 Stains often result when plant pots are used without their saucers. 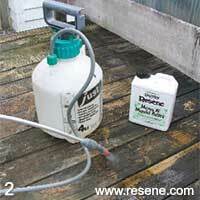 If mould is present, spray the surface of your deck with Resene Moss & Mould Killer. Allow 48 hours to achieve full kill. Scrub vigorously with water to remove dead mould residues. For stubborn stains, scrub with Resene Roof Wash and Paint Cleaner. 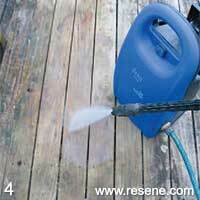 Waterblast the entire deck until clean, then leave to dry. Note that deep stains caused by water may not disappear entirely. 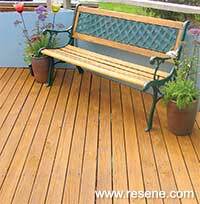 Stain the timber using Resene Woodsman penetrating oil stain in Resene Natural. Allow 24 hours to dry, then apply a second coat. 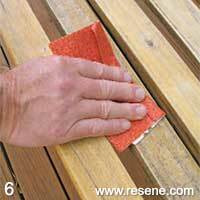 Meanwhile, sand your bench seat back to its natural surface. 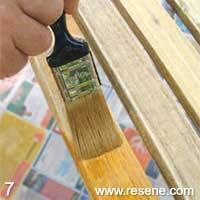 Use a wire brush to remove dirt and debris on metal legs and seat back. 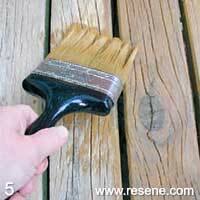 Brush away the dust, then stain wood with Resene Woodsman penetrating oil stain. We’ve used the same colour as the decking. 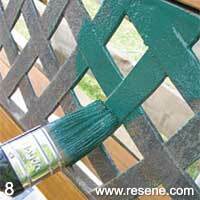 Paint the metal parts with Resene Lumbersider Resene Green Gable.